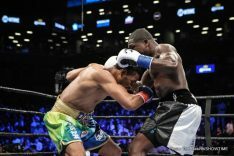 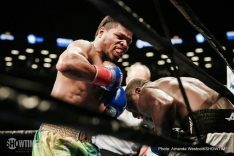 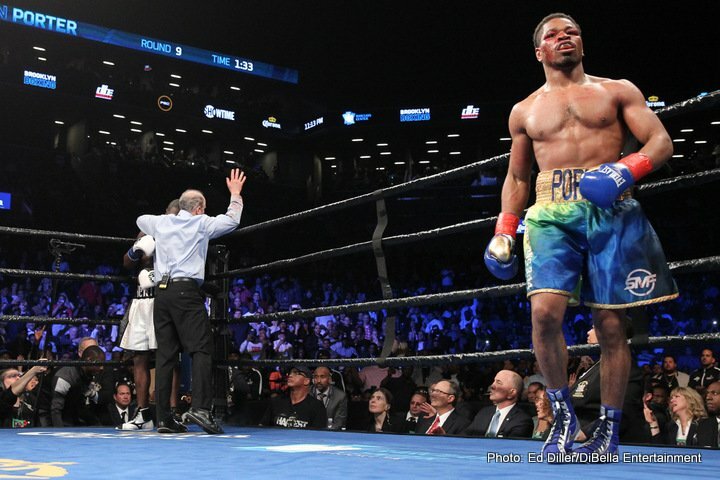 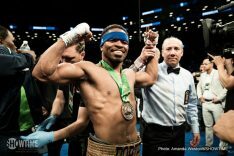 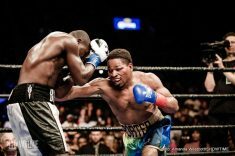 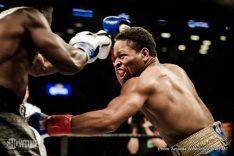 Shawn Porter scored a ninth round stoppage of Andre Berto to become the WBC’s mandatory challenger to unified welterweight champion Keith Thurman in the main event of SHOWTIME CHAMPIONSHIP BOXING, presented by Premier Boxing Champions, Saturday night on SHOWTIME from Barclays Center in Brooklyn. 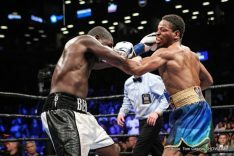 With the convincing victory, Porter potentially earns a rematch with Thurman, who he narrowly lost to last June in a 2016 Fight of the Year candidate at Barclays Center, the home of BROOKLYN BOXING™. 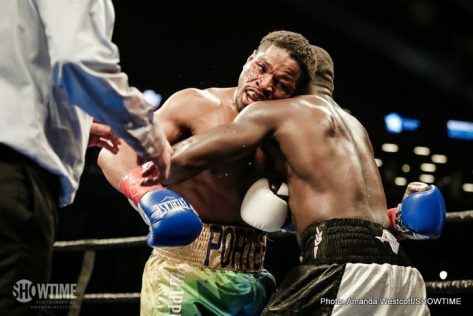 The welterweight matchup was a rough and tumble affair from the opening bell. 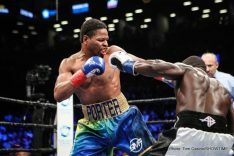 Porter (27-2-1, 17 KOs) barreled forward to smother the offense of Berto (31-5, 24 KOs), pounding Berto’s body at close range. 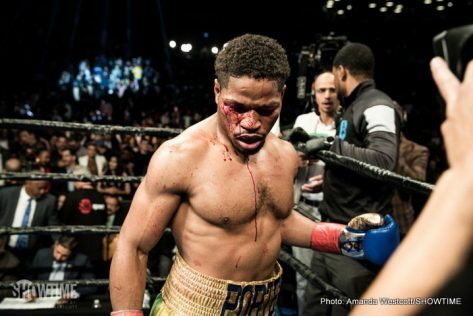 A deep gash opened over Porter’s left eye from an accidental headbutt in the second, and another opened over his right eye just two rounds later. 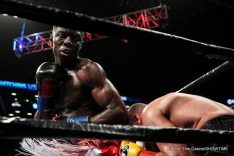 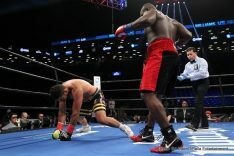 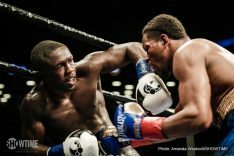 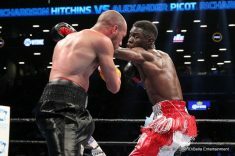 Porter’s constant aggressiveness and effective body work seemed to frustrate Berto, who struggled to stay off the ropes. An odd series of events unfolded in the opening minute of the ninth round. 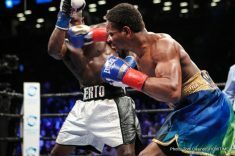 With Berto unsteady on his feet following another clash of heads, Porter pounced and floored the former champ with a left hook for his second knockdown of the fight. 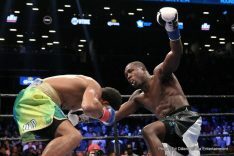 Berto got up, but Porter continued to connect with Berto against the ropes and referee Mark Nelson waved off the contest at 1:31. 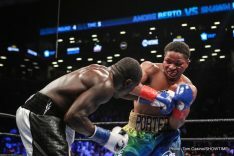 At the time of the stoppage, Porter had out-landed Berto 60-12 over the final two rounds. 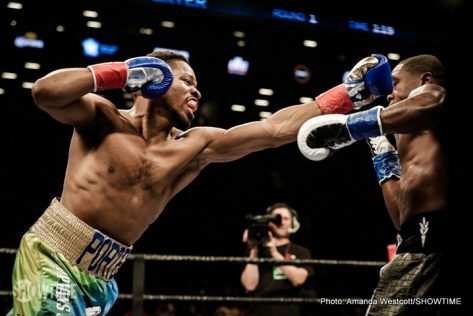 “I have to clean up those head butts,” Porter said. 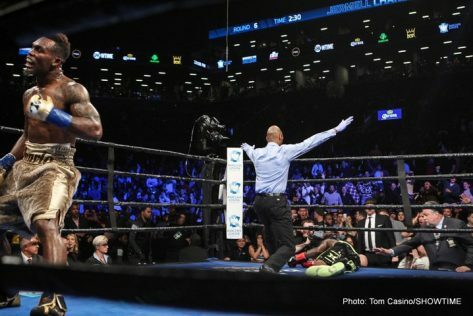 “We tried to use the whole ring, but sometimes in the heat of the battle stuff happens. 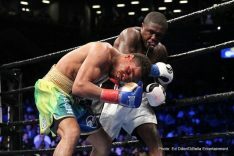 I’m a fighter and Mr. Berto is a fighter as well, those head butts were just the two of us going in and fighting. 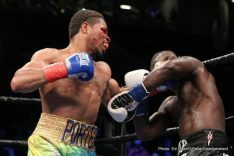 After the fight, Berto admitted that Porter’s aggressiveness and the accidental headbutts frustrated him. 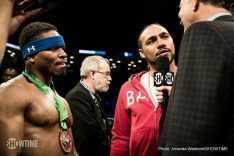 After the fight, SHOWTIME Sports reporter Jim Gray asked Thurman, who was ringside for the eliminator, if he would grant Porter a rematch. 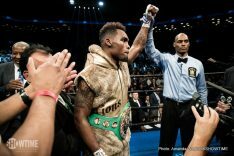 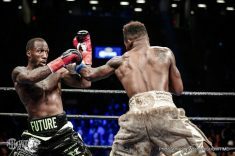 Jermell Charlo defended his WBC Super Welterweight World Championship in dominant fashion with a devastating sixth-round knockout of mandatory challenger Charles Hatley in the co-main event of SHOWTIME CHAMPIONSHIP BOXING. 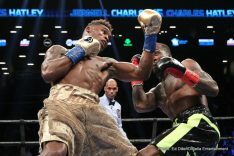 Charlo (29-0, 14 KOs) landed the crisper shots from the opening bell, using a sharp left jab to set up a remarkably efficient straight right. 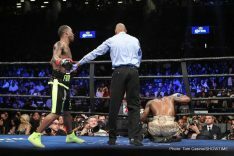 The Houston native Charlo, the younger twin of undefeated former 154-pound champion Jermall, floored Hatley (26-2-1, 18 KOs) midway through the third with a textbook left-right combo that stunned his fellow Texan. 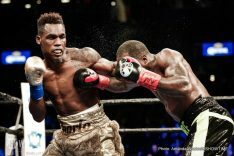 Charlo’s striking precision continued in fourth and fifth, before an onslaught of punches and a perfectly timed right to the chin sent Hatley falling face-forward to the canvas. 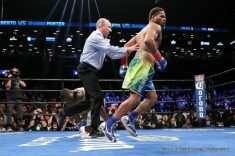 Referee Harvey Dock didn’t hesitate and instantly waved off the fight at :36 with Hatley out cold on the canvas. 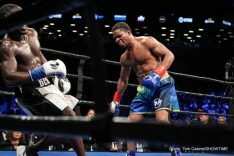 The accuracy of Charlo’s jab was telling – he landed his jab at a 31 percent clip to set up his power shots, which connected at an impressive 52 percent. 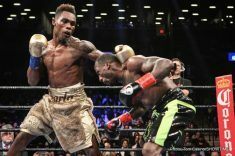 Overall, Charlo landed 42 percent of his total punches over nearly six full rounds of prizefighting. 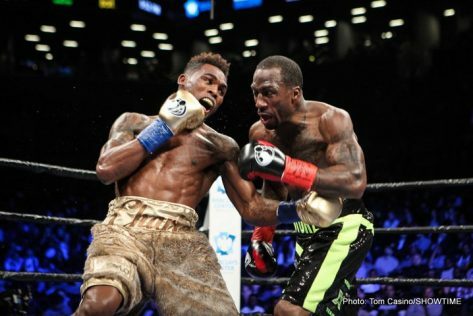 “I used that jab to set up the right hand,” Charlo said. 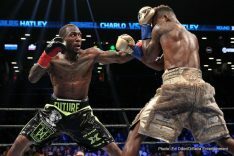 “I knew Charles Hatley goes down and he gets back up – he’s a warrior – and I knew I had to get in there and be a lion. 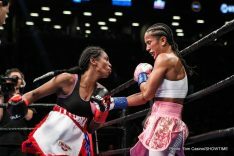 Amanda Serrano became the first women and the first Puerto Rican to win world titles in five weight divisions with an eighth-round TKO of Dahiana Santana to capture the vacant WBO Women’s Bantamweight World Championship in the featured bout of SHOWTIME BOXING on SHO EXTREME. 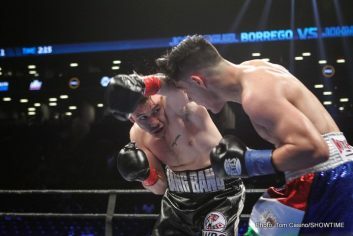 Serrano (32-1-1, 24 KOs) was the aggressor from the opening bell, moving forward and attacking with precision as Santana (35-9, 14 KOs) backed up and ate a steady diet of counter shots. 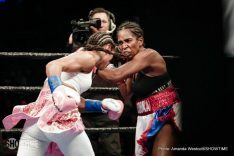 Santana was deducted a point for clinching in the fourth, and had visible welts above both eyes following the seventh. 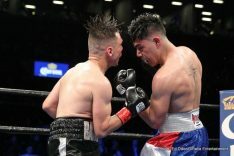 Serrano was connecting at an almost 3-1 power punch ratio when referee Benjy Esteves stepped-in to stop the bout at 1:14 of the eighth round. 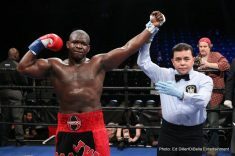 “It means everything to me. 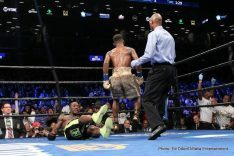 We worked so hard. 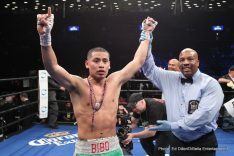 We worked hard for this moment,” Serrano said. 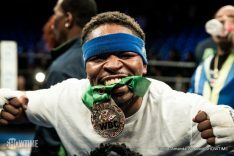 “To be a five division world champion is amazing. 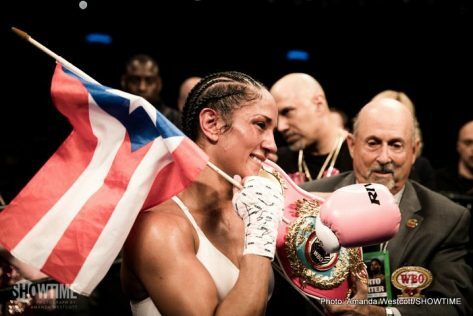 To be the first female and first Puerto Rican is amazing. 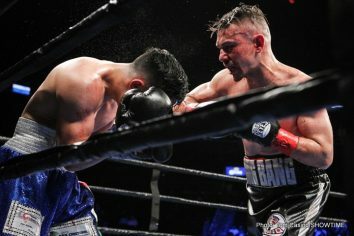 In the opening bout of SHOWTIME BOXING on SHO EXTREME, Jose Miguel Borrego (12-0, 11 KOs) knocked out a game John Delperdang (10-3, 9 KOs) at 2:07 of the seventh in a scheduled eight-round welterweight contest. 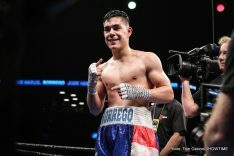 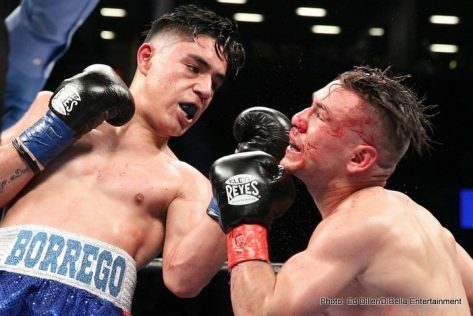 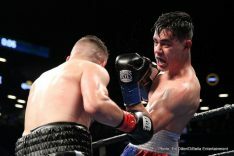 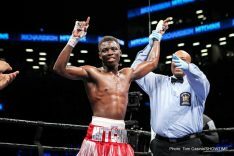 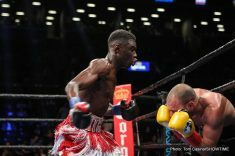 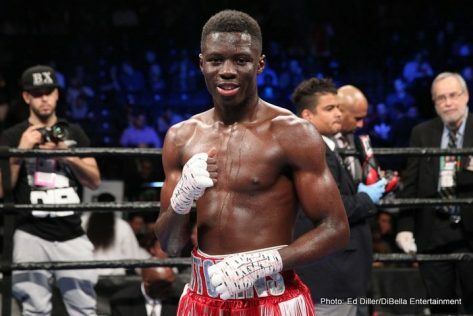 Borrego, who landed his uppercut at will throughout the bout, landed 229 power shots at a more than 50 percent clip in the action-packed bout. 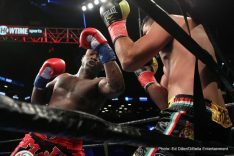 Saturday’s event was promoted by DiBella Entertainment. 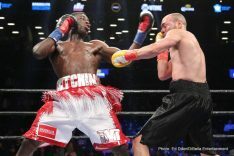 The SHOWTIME CHAMPIONSHIP BOXING telecast will re-air on Monday, April 24 at 10 p.m. ET/PT on SHOWTIME EXTREME. 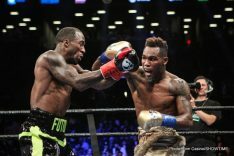 Saturday’s SHOWTIME BOXING on SHO EXTREME telecast will replay on Tuesday, April 25 at 10 p.m. ET/PT on SHOWTIME EXTREME. 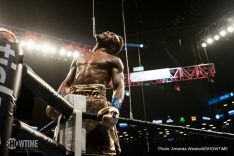 Both telecasts will be available on SHOWTIME ON DEMAND® and SHOWTIME ANYTIME®. 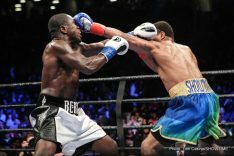 Andre Berto vs. Shawn Porter was a WBC Welterweight World Title eliminator between former 147-pound world champions. 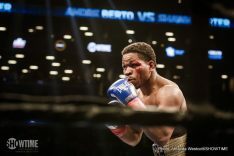 The 12-round bout headlined SHOWTIME CHAMPIONSHIP BOXING, presented by Premier Boxing Champions, Saturday April 22 from Barclays Center, the home of BROOKLYN BOXING™. 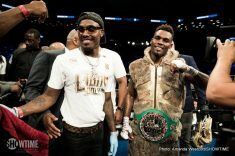 In the co-main event, undefeated super welterweight world champion Jermell Charlo battled top rated challenger Charles Hatley, with televised coverage beginning at 9:30 p.m. ET/6:30 p.m. PT.